A recent scientific paper gathered the results from several studies examining the head circumference, weight, and length (height) of premature babies. This is an excellent resource for predicting a baby's weight, length and head circumference before birth, and also tracking the appropriate growth of a premature baby through the first several weeks of life. The growth chart for premature babies is below. Note that weight in kilograms can be multiplied by 2.2 to convert to pounds (so that 1 kilogram equals 2.2 pounds, 2 kilograms equals 4.4 pounds, etc). 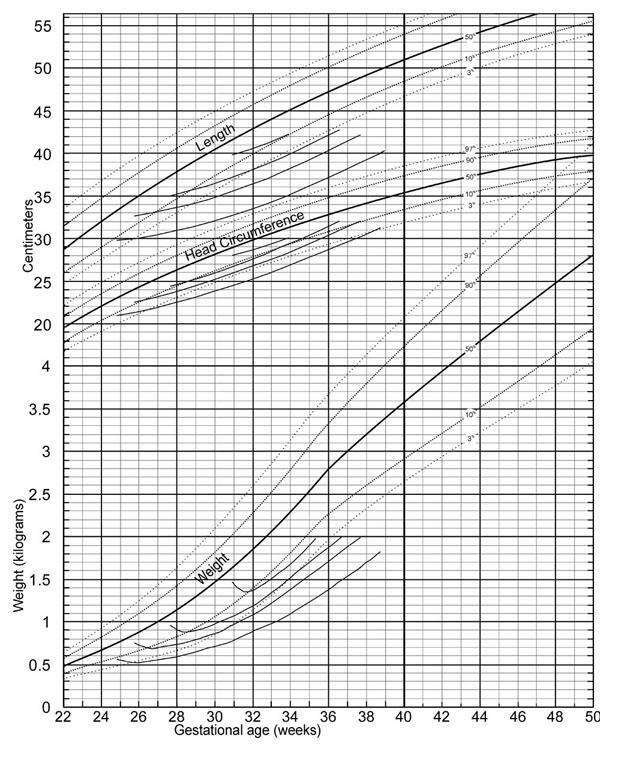 This figure was extracted under open source license from the following article: Fenton, T. R. A new growth chart for preterm babies: Babson and Benda's chart updated with recent data and a new format. BMC Pediatrics, 3, 13.